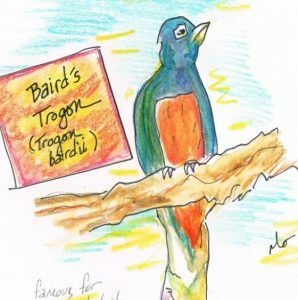 Tropical Wings is supporting the Year of the Bird​ ​by sponsoring an exhibit of student artwork depicting birds who migrate between the Upper Midwest and Central America. 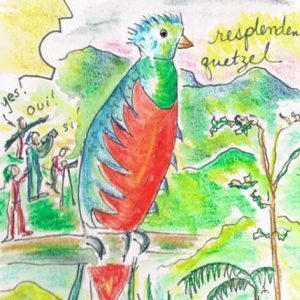 Students from five schools, some in the St. Croix Watershed and some in Costa Rica, have contributed colorful, educational artwork to this exhibit. Drawings and paintings made by students, ages 5 to 17, will be displayed from May 11th through June 9th in the lobby of the Phipps Center for the Arts in Hudson, WI. The exhibit opens on Friday, May 11, with a reception at 6:30 PM. Browse the lobby walls to see an Osprey, a Yellow Warbler, a Blue-Winged Teal, and many more. Exhibition Coordinator Nanci Olesen (above) will be on hand to describe a similar celebration and art display that took place in Puerto Jimenez, Costa Rica in early March. 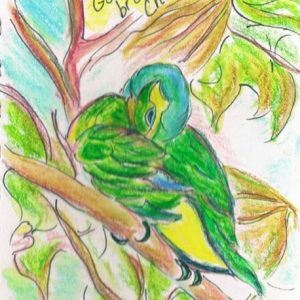 ​Accompanying the student artwork, Nanci Olesen‘s whimsical colored pencil illustrations of the Costa Rica Bird-a-thon will also be displayed. Nanci is a Montessori educator and an independent artist. She participated in the Costa Rica Bird-a-thon in February, sponsored by Tropical Wings. Her artwork from the journey will be displayed in the Phipps Community Center during the Bird Migration Celebration (opening May 11, 6:30 PM). 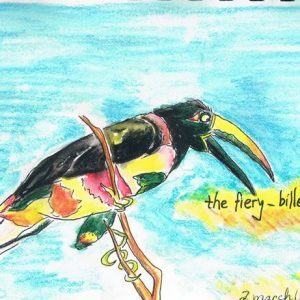 The exhibit, “Drawings and Musings from a First-Time Birder,” playfully chronicles the daily life of the Tropical Wings’ birding expedition in the rainforests, jungles, villages, and beaches of Costa Rica.